The latest “Fast and Furious” franchise, “Fast and Furious 7” left many in tears as they got to watch the late Paul Walker who passed away in a tragic car accident on November 2013. To commemorate his death and involvement in the film franchise, one of the soundtracks of the film, “See You Again” by Wiz Khalifa featuring Charlie Puth, has just released its music video which acts as a tribute to the late actor. Written specifically for the movie as well as Paul Walker, the touching and beautiful music video chronicles the footage of Walker’s journey throughout the “Fast and Furious” films. 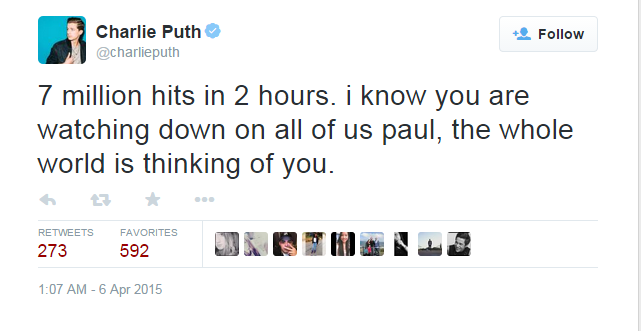 Yesterday, Charlie Puth, who also co-wrote the song tweeted, “7 million hits in 2 hours. I know you are watching down on all of us Paul, the whole world is thinking of you,” on his Twitter page. The song has become the best-selling song on iTunes as it topped the all-genre single sales chart shortly after it was released. “Fast and Furious 7” has also gone on to become a colossal global hit, having collected over USD392 million worldwide in box office sales. 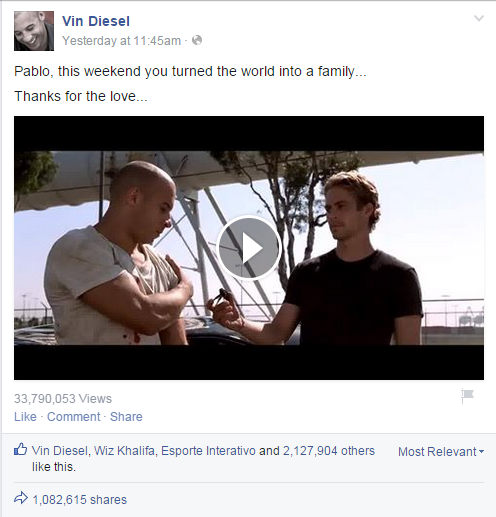 Watch the music video of “See You Again”.